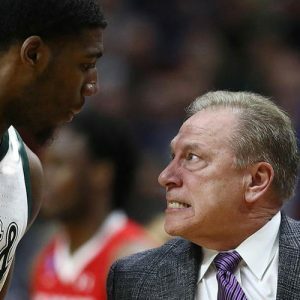 Episode 21: Will the REAL Tom Izzo Please Stand Up! It was somewhere between unbecoming and reprehensible. The NCAA Tournament is in FULL FORCE!!! And Mt. Izzo’s LATEST eruption is reverberating around the entire country — NOT in a good way. Michigan moves on easily, but did we have to be subjected to “Hollerin” Harlan on BOTH the State and Michigan games? We have breaking news today: throwing and catching the baseball is important! We heard it on a Tigers broadcast! Film at 11:00! Denny, Eli and Bob spout off on Mike Trout’s MONSTER 12-year, $430 million dollar contract and the ego-tripping billionaires who are writing all these ridiculous checks. What’s it really like to do TV sports in New Yawk? YOU try to deal with the likes of Phil Esposito! Those stories and much more right here!